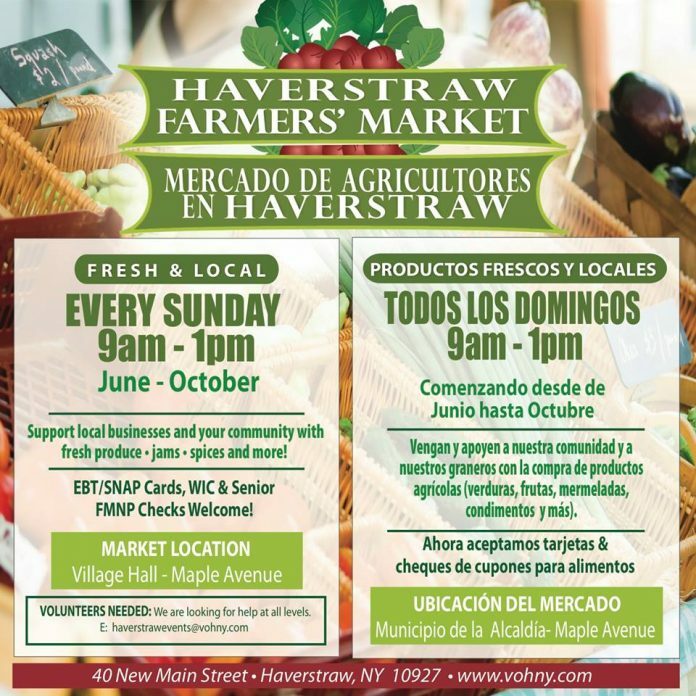 Every Sunday and Wednesday from 9 a.m. until 12 p.m. across the street from Haverstraw Village Hall, you will notice a small farmers market. This Sunday, the market promoted the local children’s reading group and fresh produce from the Perez Farm. Javier Perez started his farm 10 years ago in Goshen, NY with his wife and children. Every Monday and Tuesday, he wakes up at 5 a.m. with his family to tend to the farm and pick the produce to load into his cargo van. He sells his produce at various farmers’ markets from Wednesday, Thursday, Saturday and Sunday. Perez worked on another farm for 25 years until he was able to purchase his own land in 2008. The work is hard, especially with only three sets of hands to get the job done. The farm only provides in the spring and summer—therefore he has to work in refineries all over the country to make ends meet in the off season. “I thank God for the support—that we are able to continue to produce after all these years,” said Perez. Next to the tables filled with crates of fresh vegetables is a colorful table with Yolanda White and Stephanie Warren of the Children’s Department for the Haverstraw King’s Daughters Public Library. The two sat in the heat to promote the department and the library. The Children’s Department holds a weekly summer show and program Wednesdays and Thursdays at 4 p.m. in the village branch, and 7 p.m. at the main branch. The department provides services for children from toddler to tween age.